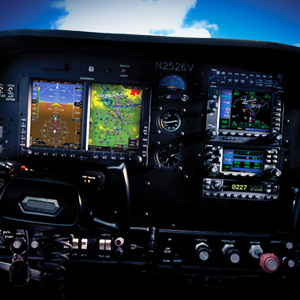 Garmin is t he world leader in aviation systems and Skye Avionics is your source for Garmin Aviation products. With so many changes happening with aviation regulations, the requirement to be ADS-B equipped. And the advancements that have been made with WAAS and other systems, the avionics field has never changed this much in only a few years. This is our priority, to stay up-to-date with modern avionics systems and trained in programming and servicing them. Our technicians are factory trained on the G1000, G600, G500 and other systems. As well we have completed numerous installations over the last 20 years. This is beneficial for you, that you have knowledgable installation and service engineers that are up to date with factory training and understand the integration of so many systems. Our technicians travel worldwide and can complete any size installation at your location. Or you can select from one of our fabricated harnesses that are ready for installation. These can reduce installation time, ensure that you receive a premium installation but also allow you to save some money. We have also put together Garmin G500 kits for the Robinson R44, Bell 206, Bell 407 Helicopters that allow for minimal down time and a timely installation. Our capability’s include manufacturing a completely new instrument panel to fit any avionics stack that you would like to have. We offer competitive pricing, beat posted prices on the internet, and can design a custom solution for any operation or requirement.